For other people named Dan Edwards, see Dan Edwards (disambiguation). Daniel Moody Edwards (August 17, 1926 – August 7, 2001) was an American gridiron football player and coach. He played professional as an end in the All-America Football Conference (AAFC), the Canadian Football League (CFL), and the National Football League (NFL). Edwards played college football at Georgia. 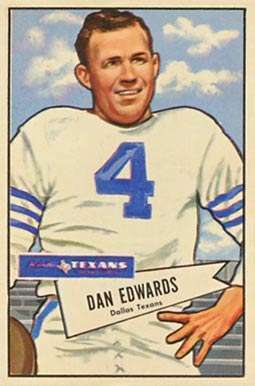 Drafted by the Pittsburgh Steelers in the 1st round (9th overall) of the 1948 NFL Draft, Edwards played for the AAFC's Brooklyn Dodgers (1948) and Chicago Hornets (1949) and the NFL's New York Yanks (1950–1951), Dallas Texans (1952) and Baltimore Colts (1953–1954). In 1950, he was selected for the Pro Bowl and First-Team All-Pro. He holds the record for the shortest kick off return for a touchdown, 17 yards, set on October 17, 1949. Following his playing career, Edwards spent four seasons as a coach with the BC Lions and Edmonton Eskimos before leaving football to become an oil executive. ↑ Hunter, Gorde (May 19, 1962). "One Man's Opinions". The Calgary Herald. Retrieved May 1, 2011. This article is issued from Wikipedia - version of the 3/21/2016. The text is available under the Creative Commons Attribution/Share Alike but additional terms may apply for the media files.